As the introduction suggests, this is a piece about what it means to be a person who teaches but also a person who teaches and happens to have autism. I have it – not to be confused with it having me. I tend to frown upon the word “disability” – it's more of an aspect of me, maybe even a strength or ability. I was born and raised in Brooklyn, NY. I went to college on Long Island for social work and psychology, specializing in supporting at-risk youth. I took courses towards a dual masters degree in history and special education. I was first officially diagnosed with autism when I was in 2nd grade, but they called it “Pervasive Developmental Disorder - not otherwise specified.” Like many children on the spectrum, I had trouble focusing and staying on task, which they later attributed to ADD. The life I live now, I am proud to say, is a life of independence and joy. I think having many valuable resources available to me as I was growing up was an integral part of my success as an autonomous adult. From early intervention to the resource room in public school, I feel that I've had the support and encouragement needed to achieve my personal best academically and interpersonally. My mother was knowledgeable on the types of services that would benefit me most. She routinely attended child study group meetings for updates on my progress and to learn about any possible accommodations. My mother also worked alongside support staff on our family's behalf to guide her in securing what I needed. In elementary school I was in mainstream classes for the majority of my subjects. I did fairly well with the “push in” help and smaller group settings. Some strategies that I've used since then were things such as finding special educational services that were able to be carried into my college courses. Whether it was extended time on exams or clarifications from the professor, I was able to be my own best advocate and vocalize what I needed. That's really what it’s all about – knowing what was needed and trying hard to find support. But more importantly, what I personally needed. Never what was expected or typical. Things that now come easily to me had to be learned through years of repetition. For example, making my own phone calls to schedule my personal doctor appointments, arranging for transportation, opening up my own checking and savings account and learning to be financially responsible. I had to learn to balance my social and work life (let’s be real though, who doesn’t?). My parents, while very involved in my growth, never sheltered me or made me think for a second that I couldn’t do something because I was on the spectrum. In a recent phone conversation my mom said this, “Disability doesn’t mean that you should value experiences any less. Keeping you sheltered doesn’t open you up and prepare you for the world.” With her confidence and encouragement in my abilities, I tackled my social anxiety head on. I mentioned above that I am a teacher; it’s a job that I am committed to and feel passionate about. I always try my best to teach from a place of compassion, understanding, and the added lens of being a person on the spectrum. I try to think of all the various reasons a child may be acting or reacting to different situations. I try and remember to use all of my senses and my training together to assist children; I assess what they want and need in order to have meaningful experiences at school. I feel very fortunate to be able to play such an integral role in these children's lives, and I look forward to work every day. I don't know if I would previously describe myself as a proud autistic person, because it's like anything else, it's just what I am, not an accomplishment so to speak. When I am able to break through to a child and help them feel comforted, understood, validated and safe, I feel proud knowing that something connected with them enough to allow them to let me in, even if it's for a brief second. It is my hope that my personal connection to the topic may be used to inspire others and open up future dialogue. At the end of the day, I'm just a person in the world who wants to leave it a little bit shinier and sparklier than I found it. This is my hope. As 2018 has come to a close and we reflect on all that our JCC has accomplished, we are very proud. Our Center is fortunate to have an active and vibrant community of families and individuals that make up our membership. However we would like to express our gratitude to and pride in the staff team that we are so lucky to be a part of. The JCC staff is truly the hidden jewel of our community. We are continually thinking about and implementing ways to improve our programming, our service and our environment. But we realized that we also needed to start reflecting on our staff culture – reimagining and refining it to ensure our JCC’s continued future success. In November 2017, the JCC Association offered a professional development seminar: “Improving Staff Morale and Building a Healthy Staff Culture.” The three of us attended and learned so much about nurturing a staff and its culture. Following the conference, our entire staff spent most of 2018 working together to create a staff vision that we all believe provides opportunity, makes improvements, sets expectations, encourages growth and harmony and fosters an overall healthy work environment. We also got together in small group breakfast gatherings in an ongoing effort to share our ideas and concerns. While this was going on, we learned that there was soon to be an executive leadership change, and we feel so fortunate that Mike Goldstein was appointed as our new Executive Director. Not only has Mike been a part of the JCC staff for so many years, but he truly understand the importance of staff. One of his objectives as Executive Director is to focus on staff so that as a unified team, we continue to move the JCC forward in a strong, relevant and meaningful way. As we begin 2019, we are energized to continue to serve our community as best as possible. We are also very proud to share that we recently learned that our agency-wide focus on staff is being recognized at the JCC Professional Conference in February. We will be receiving a national award for our Staff Engagement and Initiative effort. We look forward to receiving this award – on behalf of our staff team – in front of hundreds of JCC professionals from across North America. The award recognizes the commitment our JCC staff has made as we continue to work together to serve the Central NJ community. Happy New Year to all! May we all go from strength to strength. I am sitting in my office at the JCC attempting to write this blog, which is very daunting. The content itself is not the intimidating part, but how to convey my thoughts and feelings is the part that eludes me. I am not a “touchy-feely” person, and black and white is how I express myself best. Reflecting on my recent time as a volunteer at the Pittsburgh JCC makes me uncomfortable, not for what I experienced, but for the feelings that reemerge after reflecting on my time spent there. Last April I was asked to participate in a program called JResponse. This program is the brainchild of Doron Krakow, the President & CEO of the JCC Association of North America. After the devastating floods in Houston, and the effects they had on the JCC there, JResponse was conceived as a way to address the immediate needs of a JCC in crisis. This program provides training and deployment for select JCC staff from across the country to assist in recovery efforts. I was honored to be selected as part of the first cohort of JCC staff for JResponse, and I received my training in Memphis back in May. As we were being trained and prepared then, imagining natural disasters like hurricanes and floods, none of us ever thought our first deployment would be after a shocking event like the October 27 shooting at the Tree of Life Synagogue in Pittsburgh. On November 30, after a very long drive and multiple podcasts ringing in my ears, I arrived in Pittsburgh. I was told, along with other responders, that we were there to simply relieve the Pittsburgh JCC staff, who had been working non-stop for over a month. In the tight-knit Jewish community of Squirrel Hill, located only a few blocks away from the Tree of Life Synagogue, the JCC became the emergency response, triage and respite site in the wake of the horrific shooting. The staff had been going almost 24/7 since the incident. I was not due to start until the next morning, but me being me, I had to drive over to the JCC and get my bearings. As I drove down a beautiful tree-lined street, staring at the ornate houses passing by, I was about to make a turn and I slammed on my brakes. There, on the corner, was the Tree of Life Synagogue. One could not miss the police barricades still standing at attention or all the memorials placed with care. I had no idea that the shooting took place just blocks from the JCC. Every day I passed by that corner and every day I felt my heart break apart, piece by piece. My time at the Pittsburgh JCC was poignant, as I spent my days helping in the Senior Program or walking the halls with Security personnel, I met so many people; JCC Members and Staff alike. Everyone was warm, kind, and always smiling. I was 342 miles away, but I felt like I was still in my home JCC in Scotch Plains. Throughout the day, many members and staff asked me who I was and why I was there (it wasn’t hard to pick the JResponders out of the crowd, as we were wearing our bright blue JResponse t-shirts). Without fail, after telling my story, every single individual thanked me profusely. As I sit here in reflection, I realize it should have been me thanking them for showing me and all of us their courage and resolve. I should be thanking them for leading by example, and for demonstrating that an act of hate cannot and will not stop us as a community. We all, as JCCs, are connected even though we are miles apart; we may look different and work differently, but we are all one community. We are a community that is welcoming and warm. We are a community that unites during times of struggle and times of celebration. We are a community that hurts together and heals together. We are a community that grows stronger together every day. It says it in our JCC name and we should never take it for granted; we are a COMMUNITY. My JCC (Jewish Community Center), where I serve as the COO, is asking our community why and how they connect with the JCC. This brilliant social media campaign, called #whyij, is inspiring people to think about all the ways in which the JCC enriches their lives – from school, to camp, to seniors, to building lifelong friendships, all of it creating community. I am proud to work for an organization whose members are so passionate and whose mission is basically to make the world a better place in which to live. So on one level, that’s “whyij” – because I have chosen to work in the field of Jewish communal service, where the focus is building a “home away from home” for the Jewish community and community at large. The JCC is a force for goodness in a world which seems increasingly broken. Yet as I continued to ponder the #whyij question, it occurred to me that there is more – something relatable through an experience my brother, David, recently had. David is technically my half-brother (though I don’t think of him as such), as we come from different mothers. His mother’s side of the family has roots in former-Soviet Eastern Europe (Ukraine, Moldova). 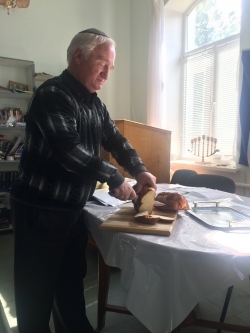 This past September, David traveled to Ukraine, visiting Kiev as well as the old villages (shtetls) noted in his great-uncle’s journals (his mother’s mother’s brother). From Ukraine, David traveled to Israel, mapping the sort of “darkness to light” trajectory that my own JCC’s communal trip recently followed. One day, David Facebook messaged me that he was in Kiev, and there is apparently a JCC there, and did I know anything about it? Well, no, but I was aware of the newly-formed JCCs in Warsaw and Krakow mainly because of my JCC’s recent, aforementioned trip. These Polish JCCs are very much based on the American JCC model and are instrumental in the rebuilding of Jewish life in a place where it was nearly extinguished in the Holocaust, and then was brutally suppressed by decades of Soviet rule. Indeed, the JCC model has served an important purpose in post-Soviet society, “twinning an American Jewish community concept with the cherished and esteemed cultural and intellectual acumen of Jews in this region” (JewishMiami.org, Federation News). But no, I had not heard of the Kiev JCC! What happened next truly illustrates the modern miracle of the Internet, and how it connects our world in unprecedented ways. 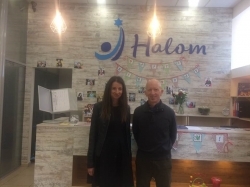 I Googled “Kiev JCC” and found that the “Halom JCC” was established in November 2016 in Kiev and is led by a dynamic, young director named Anna Bondar. In locating Anna on Facebook, I found that we have 4 mutual friends (who knew?!). So I simply FB messaged her, explaining that I was reaching out on behalf of my brother who is in Kiev and would love to see the JCC there. Within 10 minutes, I had a response from Anna, who graciously hosted David at the Halom JCC the very next day (see photo below). Just amazing! After Kiev, David went on to visit the shtetls noted by his great-uncle. David connected with the small handful of Jews (see photo below) still living in and around places like Zhmerynka and Mohyliv-Podolski. 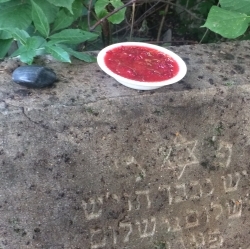 As part of his spiritual journey, David visited the old Jewish cemeteries where he tended to the headstones, and even brought the ancestors a bowl of borscht (see photo below)! For a thousand years before WWII, Jewish life in this region was abundant and vibrant. Today, not much of it remains, but it is definitely resurgent through agencies such as the Halom JCC, and others like it in St. Petersburg, Odessa and elsewhere. In fact, the Yesod JCC in St. Petersburg is the first Jewish building to be built in Russia in almost 100 years. Gazing at David’s photos from the old Jewish cemeteries makes me think of the recently-observed Yom HaShoah – Holocaust Remembrance Day. What made this year’s Yom HaShoah unsettlingly unique were the multiple reports concerning the lack of knowledge and understanding about the Holocaust among younger generations of Americans. This increasing ignorance and sense of apathy is alarming, to say the least. Not only that, but here in America we seem to be seeing the residual effects of this apathy in the recent rise of open anti-Semitism and white nationalist movements across the nation. And so it is through my brother’s journey to Ukraine, where he connected to Jewish life past, present and future, I am inspired to consider further “whyij.” I “J” because I appreciate the history of the JCC movement, where beginning in the mid-19th century, Jews in America formed organized centers of community where Jewish life would thrive and grow. 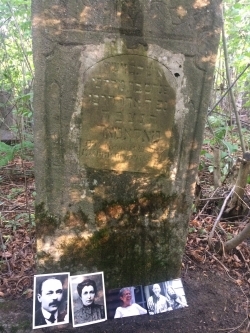 Many of these Jews had recently emigrated from places like Zhmerynka, where building Jewish community had become a dangerous pursuit, and in most cases, was openly persecuted by authorities and non-Jewish neighbors alike. In the New World, the social and political organization of the American Jewish community became a model for other ethnic immigrant groups. The burgeoning JCC movement became synonymous with the American Dream, in which a human being may enjoy life, liberty and pursuit of happiness, all with freedom of religion. So I “J” because I appreciate that a JCC in 2018 is a place where a person can feel proud and safe to be Jewish, and regardless of their level of observance, in a multitude of ways, can take further steps in their Jewish journey. I “J” because a JCC in 2018 is a place which welcomes the entire community with open arms, regardless of religion, background, ability or financial means — in a word, a JCC embodies the value of inclusion more than any other organization I know. I “J” because I know the history of the JCC movement, and I appreciate the great efforts involved in building those first JCCs (then typically called YM-YWHAs) in the late 19th and early 20th centuries — our forbearers were realizing the American Dream. Considering the Kiev JCC, it really resonates, then, that its name, Halom, means “dream” in Hebrew. The Jewish community of Kiev is now realizing their own dream, thanks to a newly-found liberty to do so, also with the support of the American Jewish community. Because of this dream, Jewish life in Eastern Europe is rising out of the ashes formed by hatred and prejudice. I “J” because a JCC is the embodiment of this hopeful, brave dream. May we here in America never forget this, and may we never take our freedoms for granted. May we go from strength to strength, stand tall and continue to dream. This November, the movie Wonder based on the critically acclaimed novel was released. The story is based on the young adult book by the same name, which was written by R.J Palacio. Wonder focuses on the life of Auggie, a young boy who was born with a severe facial deformity. When it comes time for Auggie to enter middle school, his mom decides to stop homeschooling him, and sends him to a local school. Students in Auggie’s new school are slow to accept him. Some children make fun of him and call him names, while others avoid him completely. It’s not until Jack and Summer look past Auggie’s appearance and see him for who he is that the other students are able to do the same. As soon as I heard about Wonder, I grabbed Mallory, Jodi, Cathy & Jordyn to go see it. We learned so much and truly enjoyed taking the time to see this special film together. We each had different takeaways and reasons that the film was meaningful in the work we do for camp and it got us talking… We discussed the dangers of social engineering kids, about how kids are more tolerant than we sometimes give them credit for, that sometimes growing up is harder on the parents than the kids, and we were reminded just how incredible each individual child can be when they are nurtured to be themselves. This is what fed our decision to make sure that we use the central theme of “spreading kindness” to inform the things we do in camp this summer. We want each camper to be able channel their “inner-Jack or Summer,” two characters in the film who showed kindness to Auggie and were able to do the right thing and see past Auggies disabilities. We’ll be highlighting random acts of kindness through our camp bracelets, fostering an environment of tolerance and acceptance and continuing to remind each other why Yachad R-O-C-K-S! Camp Yachad holds a special place in my heart, mainly because I have experienced a lot of “firsts” there throughout my life. I was four years old when I began my camp adventures in Chaverim. I remember being so excited to wear my camp shirt, pack my camp backpack with everything that I would need, and put loads of sunscreen on before walking down to the end of my driveway, holding my mom’s hand, to wait for the bus. Camp Yachad provided me with my first bus ride experience, and while a bus ride by yourself at the age of four almost guarantees a tantrum, I never cried or felt nervous because of the smiling faces of my bus counselors, the spirited and decorated seats and windows, and the excited energy that never ceased to arise as we pulled up to the JCC. Everyday and every year as a camper at Camp Yachad, I experienced new firsts, made dozens of new friends, laughed and smiled uncontrollably, and made timeless memories. My summers as a camper at Camp Yachad made me realize that it wouldn’t feel like summer break unless I was at camp. That realization made me aspire to be a counselor at the camp that helped me break out of my shell as a child and have so much fun each and every day, mainly because I wanted to provide the same experience for other campers. When I turned 13, that aspiration remained, and I began my journey of new firsts as a Counselor in Training. When I was a CIT, Camp Yachad seemed like a whole new world. I had no idea the amount of work, time, and effort it took to create the environment of camp, prepare staff members to be responsible and aware about the daily routines and safety measures for the next 8 weeks, and the logistics behind each and every day for every single camper. After attending staff trainings, meetings with my co-counselors, and answering questions and introducing myself to parents, I felt ready to begin the summer and provide my campers with an amazing camp experience. Camp Yachad gave me my first taste of true hard work and responsibility, and I was hooked. I was excited about coming to work, even though it didn’t feel like a job to me. I was passionate about working with the campers, making sure they were happy, safe, and getting to every activity on time. I was ecstatic to be a counselor at a place that felt so familiar to me, yet everyday brought something new and different to my life. Whether that meant singing new songs with my campers at Boker Tov, helping a child grow more confident with his or her swimming abilities, or even feeling within myself that I was becoming more mature, animated, and capable as a counselor and person. Camp Yachad provided me with these sentiments for the next seven years as I moved each year up the ranks, eventually to senior counselor, running my own group of campers and counselors for three of those seven years. Throughout these summers, I learned how to create and foster amazing group dynamics, be a role model for my junior counselors and CITS, and confirm my passion and ambitions for becoming an elementary education teacher as my career. Although my years as a counselor at Camp Yachad helped me grow an incredible extent, I knew I was capable to do more and give more to the place where I grew up. I began my summers with Camp Yachad when I was four, and now, at 22 years old, I continue my summers at the same place I started with the same vision, but with a different job title. I strive to provide the campers that attend Camp Yachad with the same amount of fun, energy, and impact that I experienced as a camper myself, as a counselor with my own group each year, and now as a member of the leadership team. Currently, I work toward achieving that vision through different outlets, as I am the supervisor for the specialists this summer. This means that I must ensure that each activity is enjoyable, unique, and memorable for each camper in every unit. My vision was once targeted to a single group, watching over a few campers, but now, being on the leadership team, it has allowed me to focus on the camp as a whole, and with more responsibility, more firsts have occurred in my life. These firsts allow me to understand more about the camp and myself as a person each day. I have learned that I really enjoy working in an administrative position, helping the specialists that work for me with anything they need, as well as checking in on each camp group to see how I can make their experience that much more fun. I have more opportunity to work with all of the staff and leadership team members that I looked up to as a counselor and still do now. Most importantly, I am able to see the camp environment in its fullest capacity and interpret the best way I can have an impact on the counselors and campers. I have a lot to thank Camp Yachad for. My biggest thank you, though, is the fact that every summer, I have grown into a better version of myself by the end of August because of what this camp has provided me with. The experiences I had when I was merely a camper in Chaverim, to a young adult during my counselor years, and now as a college graduate in a leadership position, I have been shaped and molded by this camp in ways that I did not think was possible. I am forever grateful for Camp Yachad for allowing me to continue learning, maturing, smiling, and laughing every day and for years to come and for the countless firsts I have experienced on its campsite. It must have been at least 90 degrees in the kitchen. The two huge convection ovens were set for 400 degrees, and outside the kitchen door, the room was filled with over 100 people hoping that this would be their lucky night. That could only mean one thing—the JCC’s Annual Texas Hold 'Em Poker Tournament. On pretty much any other night (or day, for that matter), you’d find me fulfilling the role of Chief Operating Officer at the JCC. But that evening, my job was hustling in that hot kitchen to cook the hot hors d’oeuvres—kosher piggies in a blanket and mini knishes, to be exact. Tournament poker can work up quite an appetite, and 12 huge trays of those little snacks disappeared in about 30 minutes. I guess I did a decent job. My co-workers also had jobs to do that night, from running the event and thanking our generous sponsors, to processing rebuys, to just making sure everyone had a great time. And from all accounts, people had a blast—some luckier than others. In the end, the pot was split between two lucky and skilled players, one of whom was a counselor in the JCC after school program about 12 years ago when I was the director of that program (my first job at the JCC). Now Scott is married, has a young son, and is a JCC member. It’s great to see things come full circle like that. Midway through the event, our Executive Director, Jennifer Mamlet, spoke to the crowd about the importance of Poker Night as one of the JCC’s fundraising events. She spoke about how the proceeds of our events help afford things like financial assistance to offset costs of camp for families in need. Clearly Jen’s remarks resonated with many in the crowd, because not only did the event raise $35,000 (that’s $5,000 more than it was budgeted to raise), but also one donor was inspired to give a $5,000 donation which was earmarked specifically for camp scholarship assistance! Amazing!!! So now I get to put my COO hat back on (which is a good thing, because that kitchen was really hot!). One of the many things I do at the JCC is staff the Financial Assistance Committee. This volunteer committee meets regularly to review, in an anonymous and discrete fashion, all applications for financial assistance for membership dues and programs like camp and school. They do an amazing job of meeting the challenge of awarding meaningful assistance with very limited funds. And by Poker Night, held in late June, you can be sure that we’ve awarded our entire budget for camp assistance. There are times, unfortunately, where we cannot award enough to make camp affordable for a family, or that families send campers for fewer weeks than they would like to. So when I heard about the results of Poker Night, I was thrilled that I would get to make a phone call to a family who would now be able to send their children to Camp Yachad for the entire summer. Additionally, this generosity of giving will allow us to do something really wonderful. During the school year, a grant from the United Way of Greater Union County enables us to bring children from Plainfield to our after school program each week This is coordinated through Home First, a Plainfield non-profit helping families cope with homelessness by creating pathways out of poverty. Through the United Way grant, we were anticipating being able to fully subsidize the cost of 4 weeks of camp for two children. As a result of the Poker Night giving, we can expand that number who will experience the magic of Camp Yachad to 5 children! This kind of support, engendered by a fun event like Poker Night, is one of the things that make my job so rewarding. I feel both humbled and honored to serve this wonderful community. There is indeed “something about this place”. Here’s to a safe, memorable and meaningful summer! When I enter The Brody Family Early Learning Center each day I can’t help but feel a sense of pride come over me. 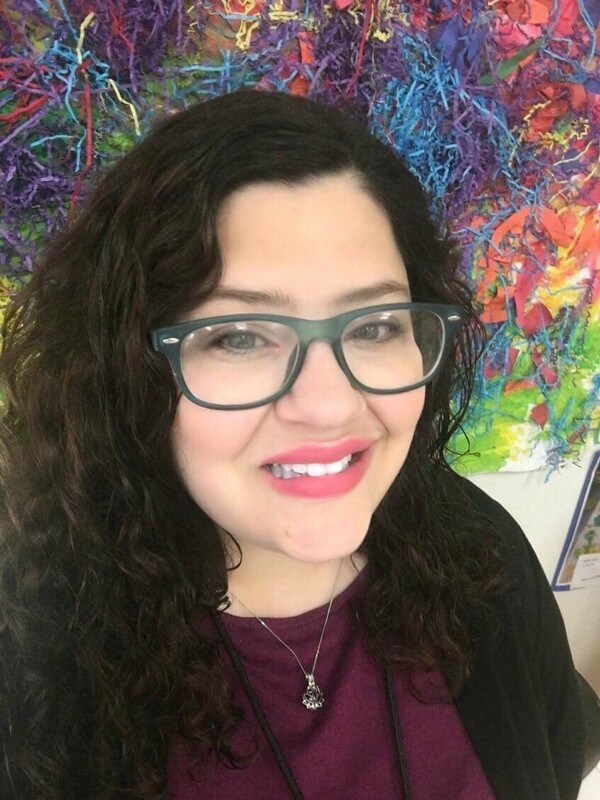 I have been working at the JCC of Central New Jersey for 15 years as a lead teacher in the three and four year old programs, and currently as one of the learning coordinators. Each day I spend time in classrooms providing professional support to teachers and ensuring that our school is applying best practices in our work with children. When I started teaching at the JCC in 2002 it was a part-time job that allowed me the flexibility of working with children and spending quality time with my young daughter. It was supposed to be a temporary position and I was fully prepared to go back to my “real” third grade-teaching job the following year. However, one year turned into 15. Now that I’m in a new role I look back with pride and marvel at how far the school has progressed. We are a Sheva Learning Community and Sheva Lab school that inspires and encourages other preschools to invest in their teachers and learn about best practices. I am so incredibly proud that I have been on this journey in seeing us become such a highly regarded school. I feel I was meant to be part of The Brody Family Early Learning Center. It has been more than a preschool job; it’s been about challenging myself professionally, inspiring others to do the same, and offering our children an exceptional and rare start to their educational experience. IMAGINE: Imagine a school where your child is valued and respected. Where the uniqueness of each child is admired. We provide opportunities for children to think critically, take leadership roles and co-construct learning with peers and teachers. EXPERIENCE: Experience a school where emergent learning begins with our youngest students. When a child brings an idea to the class the teachers begin to support and scaffold their learning with resources and materials. EXPLORE: Explore the intentionally designed classrooms. Teachers purposefully put out invitations to learn to stimulate children’s thinking. All classrooms are warm, inviting and encourage children to work collaboratively with their classmates. PARTNER: Partner with your child’s teacher to support a learning experience that prepares your child with 21st century skills. Teachers communicate with parents through weekly intentional plans, by documenting children’s learning, creating individual portfolios, and sharing pictures on secured websites. ENGAGE: Engage with a strong community of professionals that inspire and promote children to love learning. The children spend time with teachers who appreciate the importance of a quality preschool education. Our professional teaching staff inspires children to wonder, hypothesize and investigate. ENCOUNTER: Encounter a place where each child is part of a greater community. They are encouraged to be part of a team, appreciate individual learning styles and have respect for their classmates, their teachers and themselves. DISCOVER: Discover a school that provides options for your family. Early morning care, enrichment class opportunities, vacation day programs and parent–child bonding dates that create lasting memories. DREAM: Dream about a school that allows your child to develop their individual interests, develop their social and emotional skills and make long lasting friendships. Hi! I’m Chef Adam. I have to confess that I’m the one getting your camper kids to ask you to buy them papaya. And I’m the one showing them that there’s more to a grilled cheese than just white bread and American cheese. I’m the chef-owner of Schwartzie’s Kitchen, a personal chef and in-home catering company based out of Fanwood and I do the cooking instruction at Camp Yachad this summer. A few years ago I came here with my wife and soon to be born Chaverim camper. We were delighted to find a flourishing JCC in this area as we hunted for homes. Once we landed our catch, one of the first things we did was visit the JCC and met the wonderful and delightful Caren Goldberg. Hook, line and sinker and we’ve been members ever since, enjoying the fitness center, participating in the Ha’Derech leadership development program, Early Childhood program and of course, Camp Yachad. After teaching the After School at the J cooking classes since January, I now get to do the same with the Camp Yachad campers. Each week I get to entertain the kids (and counselors) with new foods and fun recipes. The first week we made fruit salad where a lot of the kids tried papaya for the first time. They made a dressing with lime juice, agave nectar & mint and even had to cut up their fruit. For week two we made pasta salad where the kids made a dressing before mixing bow tie pasta and vegetables (the broccoli was a big hit). This past week I brought out two electric griddles and we made gourmet grilled cheese sandwiches. Most of the campers chose to make the sweet “Apple Pie” option with Muenster cheese, apple pie filling and a cinnamon-sugar crust on raisin bread. We do our class outside and some of the kids are picky eaters while some of them don’t like it before they even see what we are doing. But we have three rules in cooking class: 1) we clean our hands before we start, 2) everyone has to participate and make what we are making and 3) we have to try it. And when we are done and it’s time to eat what we’ve made, some don’t like it or just don’t want to eat. But then there are those campers that make one of the counselors wait for them to finish their entire dish or I see a camper trying papaya for the first time. Just seeing their smiles and waves as they pass me in the hallways, I know that something cool is happening. And it’s happening at Camp Yachad. And it’s happening with papaya. When our family moved to Scotch Plains, we were so excited to live near a JCC where our children could be involved in a variety of activities within a safe, nurturing environment. Little did we know, our son Josh would eventually be diagnosed with autism and would not be able to participate in many mainstream settings. Although we felt discouraged, we still wanted Josh to be a part of the JCC. Lucky for us, our JCC wanted to include him and offered a “shadow” program for kids who need additional support. Now Josh is 14-years-old and the JCC is one of his (and our!) favorite places in the community. Over the past 11 years, Josh has been in Camp Yachad, After School care, fitness activities and now Intracudas. And the best part? The JCC has always been happy to help us. At every point, whenever we inquired about Josh joining an activity, the JCC provided shadow support to maximize his participation in the program. The support staff have been college students at Camp Yachad and dynamic high school students in after school activities. Every shadow has always been warm, enthusiastic, committed and sensitive to Josh’s needs. And the result? Josh feels at home at the JCC. He feels welcome and comfortable and makes progress in his activities. I remember watching Josh in his first Camp Yachad show. OMG - he sung his heart out! Recently Josh participated in a practice swim meet. The amazing aquatics staff had anticipated his needs so well that he needed little prompting to stay on task. There are many reasons that we love our JCC, but the biggest one for our family is its dedication to an inclusive environment and its willingness to explore possibilities for its members. Ready or Not, Here I Come...To Kindergarten? As an early childhood educator, I regularly meet with prospective parents who are looking for good preschools for their children. Parents want what is best for their children, so they take preschool selection seriously. Most of the parents I meet on our school tours come well prepared with questions, which typically focus on staff-to-student ratios, class size, specialty instruction offered (swim, art, music, etc.) and the schedules of all available classes. Our child has not even set foot in a two-yr.-old preschool program, and we are already wondering about his or her kindergarten readiness and beyond! When did this race to college begin at the age of two? In the era of core curriculum standards, “No Child Left Behind” and academic pushdown, it is no wonder that the perception amongst parents is that children must begin this race very early in order to succeed. In reality, nothing could be further from the truth or more detrimental to learning. Let’s dispel a common misconception: children do not need to have all of their letter sound connections or know 10 sight words or be able to write their name before entering kindergarten. Reading and writing are skills are taught in kindergarten. An interesting but little-known fact is that the ages at which children reach developmental milestones have not changed in the last 100 years. It is developmentally appropriate for five- and six-year-olds to exhibit reading readiness and comprises only one-fifth of the developmentally appropriate skills that early learning educators must focus on in the classroom. Any educator who understands all of the important skills necessary to foster a love of learning in a child knows this, but we live in a world where performance has replaced learning. Outcomes and standard based assessments have become the predictors of perceived academic success. Building the foundation for critical thinking, exploring and questioning – true learning – have taken a back seat. I think we need to begin by understanding what kindergarten readiness really is. To do a reality check from a parent’s perspective, I Googled “kindergarten readiness” and within seconds, I could easily access checklists of recommended skills children should have when entering kindergarten; I could even download a kindergarten readiness app! I was encouraged to learn that much of what is out there for parents to review is appropriate and consider social and emotional readiness as equally important as cognitive readiness. That is the good news. Unfortunately, there is still a disconnect because parents must respond to the increased academic demands on their children after kindergarten. Based on my experience, I am going to outline some tips that may be helpful in beginning to unpack and understand all of this. No one single factor determines whether a child is ready to start school. In general, a child’s maturity level, physical, social and cognitive development, his/her ability to think logically, speak clearly and interact well with other children and adults are all of critical importance to potential success in school. In reality, most four-year-olds have not yet reached full competence in all of these areas. Many children who are advanced cognitively may be somewhat emotionally immature, or a child who is physically capable, may have language delays or pragmatic speech issues. However, most four-year-olds ARE ready for the next step – kindergarten. Here are three examples from a kindergarten readiness list. I agree with the author that these skills are necessary for a child to enter kindergarten with ease. I have added my commentary for consideration in italics. Can my child listen to instructions and then follow them? Children need these skills to function in class, to keep up with the teacher and with their peers. It is crucial for children to develop good communication skills so that they may listen and interact. In early learning, educators focus on helping children become good listeners and understand their place in the classroom community. Part of this learning includes taking turns, acknowledging another’s opinion and learning to work together with other classmates. Does my child show an interest in books? Does he/she try to "read" a book by telling a story based on the pictures? This is a sign that his/her language development is on a par with other kindergartners and that he/she is ready to start learning how to read. The key is “showing interest” in books. Being read to, pretending, making predictions and decoding using pictures is considered pre-literacy. When entering kindergarten, the emphasis should be on being ready to start to learn to read, not the mastery of reading itself. Does he/she get along well with other kids? Does he share and know how to take turns? He/she will be interacting with other children all day, so your child's social skills are particularly important for success in school. Social skills include taking risks, making new friends and learning how to navigate the classroom community and get along with others. And the list goes on. For more information on kindergarten readiness, just Google it! You can find checklists, suggested games and activities to practice necessary skills, apps and a great deal of information published to help parents. But first, I would suggest understanding the developmental signs of readiness for your child. Knowing that cognitive ability is only a piece of the puzzle, and there are other skills equally as important can help take the stress and uneasiness out of the kindergarten picture. Helping your child easily transition really doesn’t take too much effort; your son or daughter already has what it takes! “There’s something about [a] place”… where Shabbat is so nice that we celebrate it twice… in one week! That’s how it is with a select few of our Kindergarteners every week. Our highly coveted “Shabbat Squad,” comprised of one member from each full day Kindergarten/Transitional Kindergarten class, serves as Shabbat Ambassadors to our Senior Adult program. Their mission is to bring a Shabbat celebration, complete with blessings and decorations, to our Seniors’ program down the hall in the Weinberg rooms Thursday mornings at 10:00. Now, we know that Shabbat truly begins at sundown Friday nights and ends sundown on Saturday nights, but we take some “artistic liberties” in order to share a Shabbat experience with a program that only runs Mondays – Thursdays! When I explain the Senior Adult program to my wide-eyed Kindergarteners I try to make it sound relatable for five year olds. I tell them it is sort of like day-camp for grandmas and grandpas or great-grandmas and grandpas. It is a fun daily program filled with exercise, meal time, music, movies and special events. “It sounds like what we have,” Sam, a recent Shabbat Squad Ambassador, told me. To me, finding commonalities breeds empathy and takes away any of the fear of the unknown or performing for strangers. Another commonality, a love and appreciation of the celebration of Shabbat, bonds the Seniors and the “seniors of our school.” Who doesn’t love singing, dancing and the adorable authenticity of five and six year olds? The smiles on the faces of the students are matched only by those on the faces of their audience. Children are natural performers. How often have we all heard, “Watch me do a split!” “I can sing ‘Let it go,’ listen!” or the ever-popular, “Look what I can do!” My Shabbat Squad expertly leads the blessings and sings original sentiments of gratitude in the “Thank you, G-d” song. When the children thank G-d for things like “pizza,” “puppies,” and “my family” we all melt at their candor and unadulterated innocence. I can’t tell you how many times I have been stopped in the hall to be told, “Oh, Ms. Randi, (my child) was pretending to be you up at Shabbat. He and his sister were arguing over which one was you and which one was Ms. Beth. He had a guitar and everything.” I feel truly honored that my love of celebrating every week with our school community carries over to my students’ lives outside of the JCC building. During Shabbat Squad the ambassadors truly get a chance to channel their inner Ms. Randi and Ms. Beth. They craft a Shabbat experience from top to bottom, from soup to nuts. They decide what songs to sing, what order to sing them in, how the table should look and who should take what part. We plan out “the agenda” at a private planning meeting in the café on Mondays at 1:00. When I pick up my squad from their classrooms they are anxiously awaiting this special tete-a-tete! It all feels very official and special to my squad. I come prepared with my notebook and ipad and document and photograph our conversation. We discuss decorations, color schemes, art work, and floral arrangements; I have been told “Trader Joe’s is the place to get roses.” It is a true meeting of the minds and we all work together to dream, craft and design. When you empower children you immediately find them invested in and anticipating the experience. I can personally tell you that the whole JCC community anticipates this weekly experience and feels a sense of celebration, renewal, and pride with every passing Thursday! My father always taught me to “leave the place nicer than when you found it.” As a child, I usually thought he meant that I had to clean my room or clear the dinner table. But over the years, I’ve come to understand that it means much more. In fact, that simple piece of advice from my dad encompassed many of the Jewish values that I live by today. To him, it was simply a way to be a better person. To me, it’s also a part of being Jewish. Working with the JCC of Central NJ family, I continue to be amazed by the countless acts of tzedakah that take place each day, in all its forms. People are making our community better than when they found it time and time again. It’s really inspiring to watch a class of 3-year-olds walking down the JCC hallway, their little arms piled high with their donations of dry and canned goods for the Mandy Reichman Feeding Program. At the food pantry, they met Meryl and Barry Reichman, Mandy’s parents who started this program in her memory. When asked why they were doing this, the pre-schoolers explained to the adults how they understood the importance of helping people, even those we don’t know. It was a beautiful and emotional moment for all involved. From generation to generation, our JCC works to teach, promote, and live up to these kinds of values. I’ve seen special moments like this happen every day here, and that’s why I am so excited to be part of Giving Tuesday on December 1st. Buy a ticket to our Winter Fundraising Social – Studio 54 – The Ultimate 70s Disco – by going here. Once you participate in Giving Tuesday and the JCC’s 180 Acts of Giving, share it with the JCC family at #GivingTuesdayJCCNJcommunity so that you can encourage your friends and set an example for others. Leaving something better than how we found it is a value we can all share. This Tuesday, December 1st, we can act on it. I am looking forward to participating, and I hope you will too. Happy New Year from your newest Camp Co-Director! As I reflect back on the last year (or should I say the last 15+ YEARS that I have been on staff at Camp Yachad and the JCC), I can’t help but feel so grateful for how far I have come. Judaism speaks of the concept of “kavannah” defined as intention and/or direction. This guiding theory is especially resonant for me professionally. When I was a senior in high school I came to the JCC as an intern for then Camp Director Robin Brous; Robin helped me find a career path I was passionate about. I thrived on the energy and happiness that you find at camp. Since then it has been my truest intention to be a Camp Director and help shape children’s lives through hands-on-experience. Realizing this dream and taking on this exciting new role strengthens my commitment to youth, community, safety, creative programming and relationship building and feeds my passion for camp. Being a part of the Camp Yachad family and interacting all year long with our incredible JCC community continues to enrich my life. It’s so energizing to me that at Camp Yachad there are so many opportunities to connect all year long; we have so many great events planned throughout the year because we want the opportunity and we want to give our camp families the opportunity to connect with those special friendships that only camp can foster. Relationships are built on shared experiences, and it is so important to continue to grow together and share in all that comes our way. As we move into this new year and prepare for the Summer of 2016, Jodi (my camp co-director) and I are hard at work on designing another incredible summer. It’s a special year for Camp Yachad – our 25th anniversary – and we are thinking about all of the ways that we can mark this very special time. Again I am reminded of the concept of “kavannah.” We are so excited to celebrate how much we’ve grown as a camp and as a camp community, but we are equally as excited to work with intention to envision great things for the future of Camp Yachad and your children! It was ten years ago that I found my “home away from home” at the JCC of Central New Jersey and Camp Yachad. And since then, it has been an amazing journey, working for my community, alongside some of the most dedicated professionals and volunteers I could ever imagine. I consider myself truly lucky to have stumbled upon the JCC, literally in my own backyard, during a critical time when I was undecided as to my next step in life. It was the spring of 2004. I had just been laid off from my first full-time camp job. In December of 2002, I had convinced a friend of a friend to hire me as his assistant camp director for a small start-up day camp in northern Burlington County, NJ. I did my best to convince Andy Pritikin that my skills developed while obtaining a master’s degree in Musicology from the Eastman School of Music, subsequently touring with a rock band, and then leading business development efforts with an Internet advertising network in the late 1990s were skills that would be transferrable to the world of day camping. I had really no idea what I was getting myself into. I just knew that I had a wife and 16 month-old daughter to help support, and a new mortgage on a house in Fanwood, and I needed a job. Andy taught me a lot during my “trial by fire” summer of 2003 at Liberty Lake Day Camp, but the camp was not large enough to sustain my year-round salary. But Andy did me a bigger favor then he knew when he put me in touch with Robin Brous at the JCC. I went to meet with Robin in March of 2004, and she offered me a job as the Yeladim unit director at the oddly-named Camp Yachad. I thanked her, and told her I would weigh her offer against other options—I was really looking for and NEEDING a full-time gig. I ended up taking a job with the new owners of Meadowbrook Day Camp in Long Valley, NJ. In the summer of 2004, Roz and Jed Buck taught me a ton about running a successful day camp. They hired me as their Transportation Director, and I learned how to design and manage intricate bus routes, and how to develop a “bus spirit” program of activities and prizes for campers on the bus ride to and from camp. What a concept! And I even got my commercial driver’s license (CDL), which I have maintained to this day. During that summer, I got a call from guess who? That’s right, Robin Brous. She told me that the JCC was looking to hire a full time “Director of Teen and Afterschool Services”. I had no idea what that meant, but the full-time part sounded good. I went in for an interview, and then a second one, and long story short, I got the job! I started working at the JCC on September 1, 2004, and haven’t looked back since then. A big part of my job, I quickly learned, would be working in Camp Yachad—the highly-touted day camp program at the JCC, which was expertly supervised by Robin. My first summer, 2005, I was the CIT director, and I also helped out with overseeing aspects of the transportation for camp. I established new standards for bus counselor training, bus spirit programming (yes, the birth of the Golden Cup! ), and even new ways of parking the buses for dismissal. By the summer of 2006, I was promoted to Assistant Director, along with my now long-time partner, Jodi Hotra (then Baxter). And when Robin became the Early Childhood director in the spring of 2007, Jodi and I were quickly thrown into becoming the co-directors of Camp Yachad. Since then, for going on 9 summers now, Jodi and I have been a solid duo. I am so lucky to work with such a talented, patient, diligent and selfless individual as Jodi. She complements my skills and experience, as I think I do hers. While we’ve tried to develop more and more of a clear division of our roles and responsibilities over the years, as Camp Yachad has grown in size and complexity, Jodi and I tend to work best when we are just “organically” playing off of one another, and working like one camp director with two heads! Jodi and I really owe a huge debt of gratitude to Robin, who pretty much single-handedly created Camp Yachad. 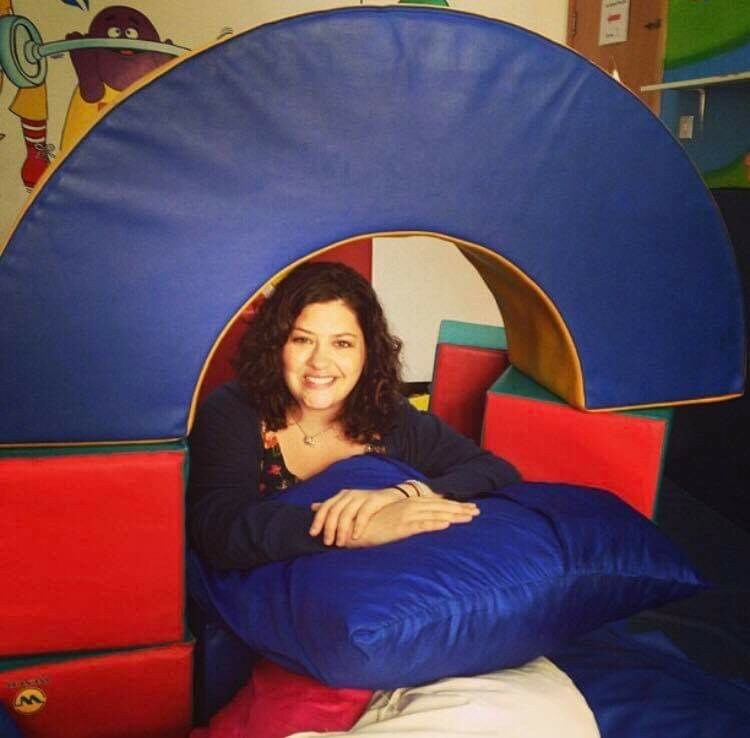 For 13 years, she developed Camp Yachad with her expertise, creativity and passion. Many of the traditions and systems of camp bear the mark of Ms. Brous. Among other things, Robin taught me to be firm yet compassionate, to never be complacent, to always be questioning and striving, and to manage risk carefully. It was a daunting thing to take over the reins in 2007, as Jodi and I saw how much Camp Yachad was truly “Robin’s camp”. The program was “Robin’s program” and the staff was most surely “Robin’s staff”. Oh, and the camp parents. The parents were “Robin’s parents”. The campers too, for that matter. Hers were big shoes to fill, and Robin helped Jodi and I fill them, as she graciously bowed out from the camp spotlight, and quietly helped us behind the scenes. I don’t know that I will ever be able to adequately thank Robin for all she has done for our community, and personally speaking, for my career. During my tenure as Camp Yachad Co-Director, I was also able to gain a lot of other JCC experience-- first as Program Director, where I supervised several other program department directors—and then as Assistant Executive Director, a post I have had since February of 2012. My duties as Assistant Executive Director sometimes pull me away from camp, and these have only increased as the JCC has grown in size of programs, members, facilities needs and operating budget. With that in mind, in February of 2014, we were able to hire a full-time professional who would be dedicated to camp (and only camp!) on a year-round basis. Jodi and I knew that we needed this person in place, as camp continued to grow. We were very pleased that Mallory Zipkin accepted our offer, and came on as Camp Yachad’s Associate Camp Director. Mallory grew up at the JCC, and then worked as the Youth and Teen Director (she was Mallory Saks then) before moving on to a Jewish resident camp (Poyntelle-Lewis Village) as their Assistant Director, before coming home to us. Present secured, and future assured! —Camp Yachad is in Mallory’s heart and soul. In retrospect, I have been extremely fortunate to have such wonderful mentors and colleagues. I have also been incredibly lucky to have found the JCC in my “backyard”—a true “home away from home”, where I have been allowed to develop and grow as a professional, while getting to help build a vibrant Jewish community. My community. Our community. It is indeed a very, very special and unique place. 10. Once you stop changing, you are done. 9. Acknowledgement is more valuable than money. 8. It’s not the object, it’s the concept and ruach behind the thing that matters (see: “The Golden Cup”). 7. You can never have enough Gaga. Ever. 6. Program Quality is more important than Facilities Quality. 5. Staff Quality is more important than ANYTHING. 4. Day Camp truly does “begin and end on the bus”. Think about it. 3. The most important state of mind one can hope to develop in one’s camp community is that of gratitude. 2. Every child should be given the opportunity to attend camp, regardless of anything. 1. There is no better place than camp for a child to build a sense of identity (Jewish or otherwise), self-esteem, resiliency and social confidence. There’s a place on Morris Avenue in Springfield where, if you look really quickly, you can see the trailer for the Springfield camp site. I bring this up because I pass that spot every day on my way home from school and the first time I see it each year is a very happy day for me. It means that camp is starting. Now camp is ending and it’s time to reflect on the last eight weeks. It was an incredible summer. I started working at Camp Yachad 21 years ago and this may very well have been my favorite summer ever. I say this because I realize more than ever how remarkable this place is. Camp is more than hundreds of campers and counselors having fun doing a lot of great activities. Camp is a community. It’s a family who work and play and eat and, in some cases, live together for eight weeks in the summer. Sometimes we don’t get along, but most of the time we do. We accept each other for who we are. From the youngest of campers to the oldest of staff we are one. Once we put on the blue, or orange, or green shirts with the words, “Camp Yachad” on it we are a family. Now I won’t see this family for another forty-four weeks and I will miss them deeply. But all I know is that in forty-two weeks I’ll be driving down Morris Avenue looking for the trailer, knowing that camp is about to start again (not that I’m counting). Camp Yachad and Community families came together several times this summer to play, dance, eat and rock out! Camp families enjoyed Family Camp Night on July 10! The Yachad campsite was open for everyone to bring a picnic dinner and experience an evening “Camp Yachad-style”. Camp families and friends enjoyed a great night of field games, camp crafts, basketball and climbing the ropes course. This amazing community evening was capped off with a shaved ice truck featuring 6 “make your own” flavors. It was a night filled with family-fun! On July 23, our favorite Jewish rocker, Rick Recht performed a high-energy concert at nearby Wardlaw-Hartridge School. We were so excited to host internationally acclaimed musician, Rick Recht for his 4th appearance at Camp Yachad! Campers and staff sang and danced on stage with Rick, singing all of our Friday favorites such as “The Hope” and “V’Ahavtah”. The energy was contagious and everyone was on their feet for this fun, family event. Rain did not dampen our Summer Shabbat Shabbang event “Shabbat Under the Stars” on August 1. Thunder and lightning may have moved us inside but we took the stars with us. Children and adults came together to welcome Shabbat with special guest, Rabbi Goldstein, to bless the candles, wine and challah. Everyone decorated stars to take home with them, dined on Israeli falafel, salad, hummus and chicken nuggets. Families then filled up the dance floor while singing and dancing with Eric Komar, who performed familiar camp songs. Please be on the lookout for more camp family fun programs at the “J” throughout the school year!! We will be on the lookout for you! As first year Camp Yachad Senior Counselors, we have been dreaming of being chosen to become Maccabiah Generals since we were campers. It was a wonderful surprise when we got home from camp last week on an ordinary Thursday afternoon, soon to realize that dream was becoming a reality. When Courtney got home, she was shocked to see two members of the Camp Leadership Team sitting on the steps of her front door. They handed her a piece of paper, a packing list for the night, with a gold Camp Yachad bracelet, and before she knew it she had a bag packed and was in the car on the way to surprise the next soon-to-be Maccabiah General. Next stop was Talia’s house where she got the same packing list with a blue bracelet instead. That was the very beginning of the two teams: Gold Fire and Blue Ice. That night, we learned who the eight Maccabiah Generals of 2014 would be as they arrived from their own Leadership Team pick up. On Gold Fire: Justin Kaufman, Courtney Lane, Jamie Levitt, and Lance Glinn. On Blue Ice: Talia Sion, Dan Firestone, Jess Rothbard, and Leigh Abramson. We spent the night crafting a plan for Break Out the next day in which we would surprise the entire camp by announcing the beginning of Color War. It was so much fun brainstorming with all of the Generals, trying to create the best way to announce this long-known camp tradition. Then the two teams divided to create our songs and cheers which we would begin to teach all of the campers the very next day. The next morning at camp, we had to keep Maccabiah a complete secret among both the campers and the counselors so Break Out would truly be a surprise. Even though some campers were disappointed that the Rick Recht was just a cover for Break Out, they were all so excited for the start of Maccabiah! Before the weekly Shabbatones Concert, all of the camp divided into Gold Fire and Blue Ice, and we began teaching our teams the songs and cheers we worked so hard on the previous night. Monday morning, every camper eagerly got off their bus proudly sporting different shades of blue or gold. Opening Session was a beautiful ceremony highlighting the core values of Maccabiah: teamwork, good sportsmanship and having fun! The next two days consisted of many different activities and competitions; some by group, by unit, or even the entire camp coming together to support their team. Some of the highlights include Gold Fire winning Anagrams and the Mostest, while Blue Ice won Tug-o-War and Yacht or Not. By the end of Day Two, the judges announced that the two teams were completely tied! The only events left for Wednesday were the all camp Apache Relay, the Song and Cheer competition, and the Generals presentations of the team banners. The Apache Relay is one huge relay race in which every single camp group does a different event all leading up to the General’s event. We had to wrap up one General like a mummy in toilet paper and whichever team finished three whole rolls won first. After a neck and neck Apache Relay, Blue Ice finished the Mummy Wrap first, winning 500 points for Blue Ice! Next, both teams sung their hearts out while performing their song and cheers for the judges. Then, the Generals brought in our team banners in which we spent hours upon hours working on after camp ended Monday night in the art studio. The Gold Team crafted a bonfire that lit up and was made of real wooden logs with real marshmallows being roasted in the fire. The Blue Team created a sparkly winter wonderland with a huge foam igloo with snowmen inside to represent the Generals, and snowflakes in the sky to represent each group and camper on Blue Ice. After a long judging session and a lot more cheering from both teams, the judges presented the results. Gold Fire won both the song and cheer events, but Blue Ice won the banner competition. The overall results made Blue Ice the victors of Maccabiah 2014! Then all the Generals ran to the outdoor pool, took off our sneakers, and as per tradition, we all jumped into the pool after what was an extremely close, hardworking, and successful Maccabiah! Summer 2014, my first at Camp Yachad has been a very special experience for me both as an educator and musician. The staff is among the most professional and caring I have worked with and the Chaverim campers are just a delight. My background as a certified “Music Together” teacher, experience in early childhood music education and passion for Jewish Learning has made this a perfect fit for me. Each morning the entire Chaverim group assembles for “Boker Tov" (good morning) and we start with a musical selection to get the Ruach (spirit) cooking. I make sure the music also provides a lesson. Yesterday we listened to “Don’t Worry, Be Happy” from Bob Marley. The kids loved it! I have for many years performed as a professional guitarist and pianist specializing in contemporary Jewish music and have performed in various settings throughout the area. So, when I was invited to join the SHABBATONES” – Camp Yachad’s very own Jewish Rock Band, I jumped. Led by our Co-Director Mike Goldstein, The Shabbatones rock the camp every Friday afternoon to usher in Shabbat in a big way and it’s a blast! When I think of how blessed we all are, campers and staff, to experience the joy of play and immersion in Jewish culture and values here at camp I can only pray that all children, in Israel and throughout the world are safe and protected and enjoy the freedoms and experiences we do here at camp every day. I am very fortunate to have two perspectives of Camp Yachad--as a counselor and as a parent. I grew up in the Westfield/Scotch Plains area and was a counselor at Camp Yachad for 5 years. At the time that I was a counselor, Rachel Toporek (our current camp photographer) was entering kindergarten and was a camper in my group. Robin Brous was the drama specialist and eventually became the camp director and my boss. It brings back a sense of nostalgia when I see my boys running around with their groups and the counselors playing games with them. While it seems like such a long time ago, my memories remain vivid and fond. The JCC is a very special place to me--it's comfortable, safe and fun. My boys love it there and I know my baby girl will too. I cherish the moments that I have watching my kids grow, learn and have fun at Camp Yachad. Now that I am the parent and not the counselor, I may have a new perspective, but the importance of Camp Yachad in my life remains. The campsite’s empty, the locker rooms are still, and the phones are quiet. It almost looks as if camp is closed on Thursday afternoons, until you go out to the outdoor pool where the entire camp has gathered, cheering for their counselors. It’s the same scene on Friday mornings, except now all the campers are gathered in the gym cheering for an entirely different and delicious reason. That same afternoon, singing fills the halls of the JCC as campers are engaged in what is possibly the most quintessential Camp Yachad tradition. As campers grow up in camp, they become part of these camp traditions: campers get to cheer “Dunk the Whale” while they watch their counselor being thrown into the pool, campers vote for the counselor they think should be pied in the face on Friday morning with "Friday Pie Day", and celebrate with their camp friends and family on Friday afternoon during Rockin’ Shabbat with the Shabbatones. Being part of these experiences is like going through a rite of passage, one which happens when campers reach 5 years old. As the Yeladim Unit Director, I believe that once campers are old enough to be in Yeladim, they are old enough to be part of the defining camp experiences. It is experiences like “Dunk the Whale”, “Friday Pie Day”, and our Shabbat celebrations that campers and counselors look forward to year after year. These are the moments everyone remembers for a lifetime. Trust me, as someone who has worked at camp for 12 years, sends her daughter to camp, and has been thrown in the pool and pied in the face more times than I can count, I still love to come back to camp every year to be part of these traditions. It is also traditions like these that set Camp Yachad apart from all other day camps in New Jersey. We cultivate a sense of belonging and community through these traditions. After all, once campers see “Dunk the Whale”, “Friday Pie Day” or sing and dance along at our Shabbat celebrations; they know that they’re part of a family of hundreds. I am so fortunate to live a picture perfect day every time I come to camp. As the camp photographer, I have to say that I have the best job! Why, you ask? It’s all about the moments captured that become memories. Capturing a moment when a camper takes their first swim without a bubble. Or the moment when one camper puts their hand in another campers hand to walk from one activity to another. Or the camper that would cry & be shy day 1 of camp that is now dancing, participating and getting their feet wet in the pool or at water play. Or the moment when a camper gets completely messy and covered in paint in art class. Or the friendships, matching hairstyles, handshakes & dances that develop within each camp group. Or the moment when all of the counselors gather their campers together, standing with their arms around each other and sing “Lean on Me” at the top of their lungs at Shabbat. Or when it’s week 7 and you see the nervousness on the faces of both the blue and gold team in anticipation of who will win Maccabiah. As a camper at Camp Yachad years ago, we didn’t have the privilege of daily image updates right at our fingertips. My mom used to come in and take a few pictures here and there, pictures that I still have today and I am grateful to have as a part of my visual memory. Thanks to technology advances, how cool is it that I can capture your camper’s special moments not only walking around the campsite but also taking the camera under the water to see the campers blowing bubbles, smiling and waving while swimming and also up high in the air while climbing, zip lining and swinging on our high ropes course. A picture is worth a thousand words. When your camper is asked, “What did you do today? Did you have fun?” and their answer is a plain “YES!” I pride myself on being able to capture the moment for posterity so you can not only see it but feel the joy, enthusiasm, and ruach emanating from your campers. We made it! After that long snowy winter, summer has finally arrived and the sun has been shining bright at Camp Yachad! Camp is a special place where community comes together as family, and the walls seem to come alive as the energy, excitement and ruach (spirit) of camp take over our JCC. On Monday morning, as my two kids put on their bright blue camp shirts for the first time this summer, I marveled as they marched on the bus without looking back. Moments later, when I got to the JCC and saw the first bus roll in, I felt my heart and eyes swell knowing that my favorite time of year had officially begun. Day 1 of Camp Yachad and our first campers were here! Already, in three short days, I have watched countless campers discovering new friends and old camp traditions, dozens of kids running up to hug counselors they haven’t seen for a year, two year olds excitedly navigating our playground, kids proudly showing off their well-earned deep water bracelets, young counselors – empowered by their responsibility - coming together to lead our campers, and campers helping friends with special needs acclimate to new surroundings. These are just some of the magic moments of camp! And although the camp buses leave each afternoon, the spirit and excitement still go on and we have a lot to offer to our JCC families. Come to our fitness center, enjoy a massage, join an outdoor boot camp to stay in shape this summer, or join us at night and on weekends to swim in our family-friendly outdoor pool! We also have special events planned for you and your kids all year – and we hope you’ll join us on July 10th for Family Camp Night so you can experience the wonders of camp as a family! I look forward to seeing you all – and I can’t wait to watch as my kids - and your kids - discover the magic and excitement that the rest of this summer will bring here at Camp Yachad! As we say each morning when we bid our campers farewell to begin their day, L’hitraot (see you later)!